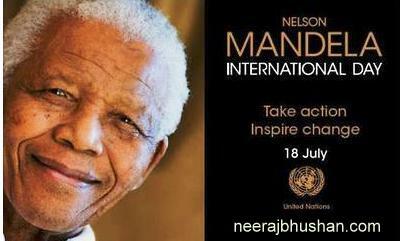 “…Be part of the Mandela movement to make the world a better place. That is the best way to wish Nelson Mandela a very happy 94th birthday.” – UN Secretary-General Ban Ki-moon, in his message for Nelson Mandela International Day, 18 July 2012. Today, it gives me immense pleasure to say Happy Birthday Nelson Mandela. This great leader has been a lawyer and a freedom fighter, a political prisoner, peacemaker and president, a healer of nations and a mentor to generations of leaders and people from all walks of life throughout the world. I am informed that a warrant for my arrest has been issued, and that the police are looking for me. … Any serious politician will realise that under present-day conditions in this country, to seek for cheap martyrdom by handing myself to the police is naive and criminal. We have an important programme before us and it is important to carry it out very seriously and without delay. I have chosen this latter course, which is more difficult and which entails more risk and hardship than sitting in gaol. I have had to separate myself from my dear wife and children, from my mother and sisters, to live as an outlaw in my own land. I have had to close my business, to abandon my profession, and live in poverty and misery, as many of my people are doing. … I shall fight the government side by side with you, inch by inch, and mile by mile, until victory is won. What are you going to do? Will you come along with us, or are you going to cooperate with the government in its efforts to suppress the claims and aspirations of your own people? Or are you going to remain silent and neutral in a matter of life and death to my people, to our people? For my own part I have made my choice. I will not leave South Africa, nor will I surrender. Only through hardship, sacrifice and militant action can freedom be won. The struggle is my life. I will continue fighting for freedom until the end of my days. – from “The Struggle is my Life”, the press statement issued while underground in South Africa, 26, June 1961. Nice sum up-chronology is quite helpful.His efforts in ending apartheid regime in South Africa are exemplary. Yup. Thanks. There are just a handful of people from the 20th century – Mandela being one of them – who will be remembered by the coming generations.